Christmas is just around the corner and I'm pretty sure that some of you will be doing a lot of baking for the holidays. For my family, baking has been part of our Christmas tradition since Clarise (my eldest daughter) was 3. It all started in 2005 when she thought that helping bake cookies for Santa would be a good way to say thank you for the gifts she will get from him. Cherlin (my youngest) was only 2 months old then. Clarise is 10 now, and Cherlin is 7, and the love of holiday baking is one thing that the three of us share. Now it's not just about baking cookies for Santa...it's more of our bonding time as we help each other make something special for our own holiday feast or to share with our close friends. We've baked all sorts of goodies together for the past 7 years...and I always see joy and excitement in their eyes as they add and mix the ingredients or mold the dough into fancy shapes. It's true that baking with kids can be messy, but I love it! When the baked goodies come out of the oven, seeing the pride on my daughters' faces as they say "We helped make that!" is priceless! This year, just like the previous ones, we'll be making peanut butter and chocolate chip cookies for Christmas. We'll also be baking a chocolate cake and these lovely treats as per Clarise's request. We call these Ensaymadas in the Philippines. Ensaymada is one of those delicious baked goodies that we Filipinos got from our Spanish colonizers. Known as Ensaimada in Spanish, it is a pastry that originated in Mallorca, Spain and is made with flour, water, sugar, eggs, and lard. The Filipino version however is made with butter instead of lard. 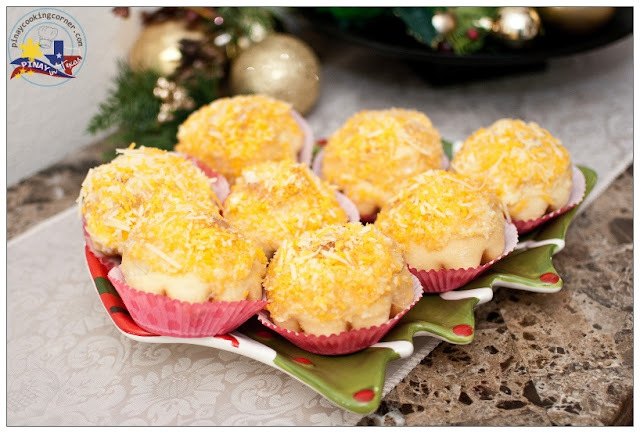 Some are topped with just butter and sugar, and some have grated cheese (usually aged cheese locally known as keso de bola) and butter cream in addition to the sugar. Ensaymada is popular as an afternoon snack and during the Christmas season, it is considered to be the best match for hot chocolate. You should try this recipe! If you have kids, I'm sure they will be happy to help. 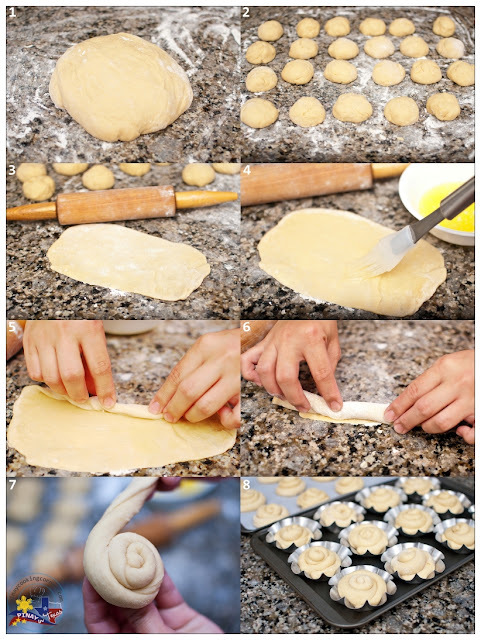 Kneading, rolling and twirling the dough will definitely be fun! 1. 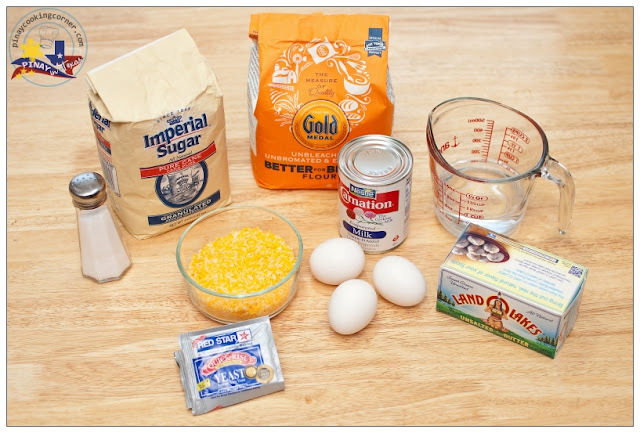 In the bowl of an electric mixer, combine water and evaporated milk and stir until well combined. Add the yeast to the mixture then the sugar, softened butter, eggs, salt and 2 cups of flour. 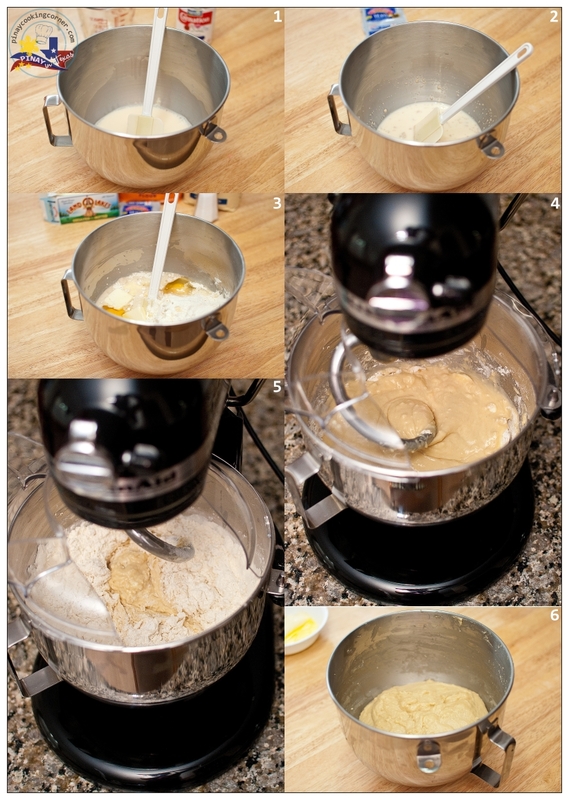 Mix on low speed until ingredients are wet, then turn to medium speed and mix for 2 minutes. Stop the mixer and add the remaining flour then mix on low speed until the ingredients are wet, then turn mixer on medium speed and mix for 4 minutes more. Scrape the dough off the sides of the bowl and pour approximately one tablespoon of olive oil all (vegetable oil will do) around the sides of the bowl. Turn the dough over in the bowl so it is covered with oil. (This helps prevent the dough from drying out.) Cover with plastic and let the dough rest for 15 minutes at room temperature. 2. On a floured surface, punch out the dough and divide into small pieces about 60 grams each. Roll out each piece thinly into 8"x5" rectangles. Brush surface with melted butter. Roll into a long rod and twirl into shape, locking the ends to seal. 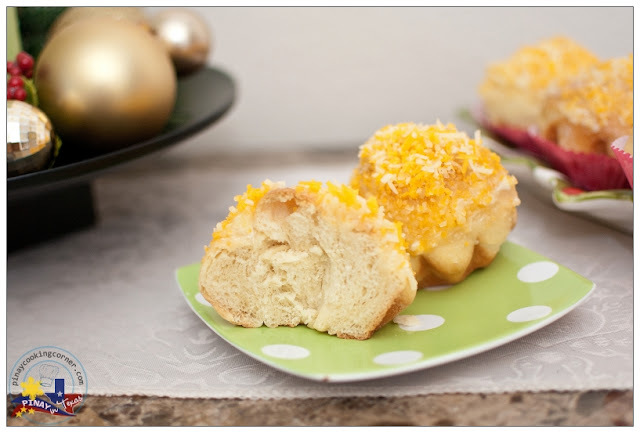 Place each piece in a greased ensaymada mold. Cover with plastic or wet kitchen towel so the dough won't dry up as they rise. Let rise in a warm place until the rolls are double in size (approx. 1-1 1/2 hours). If you don't have ensaymada molds, you can just arrange the twirled dough 1 1/2 inches apart on a parchment paper-lined cookie sheet. 3. Preheat oven to 325F. Bake for 15-20 minutes or until golden brown in color. Remove ensaymada from heat and allow to cool down in molds for 5 minutes. Carefully remove from molds and transfer to a cooling rack. 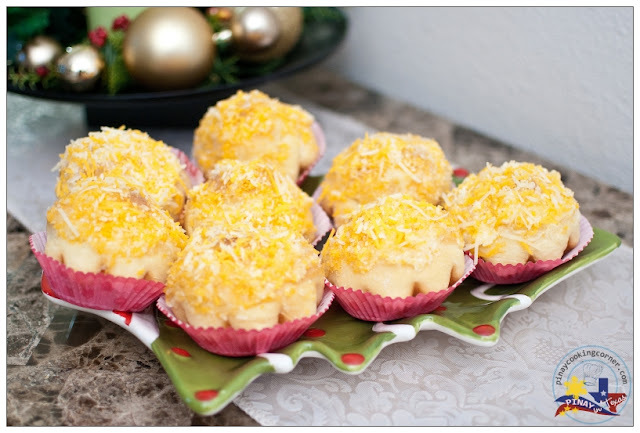 Brush with creamed butter and sprinkle with sugar and grated cheese. Really nice buns..I am already afraid to put them on the list, have got so many things for Christmas already..
Hi Tina, something new to me. This look very luscious. YUMMY! Thanks for the step by step photos and recipe. Have a lovely week ahead, regards. They were sent to me from the Philippines by my mother-in-law. Mario, these are called brioche molds here. You can look it up in Amazon or other sites that sell baking pans. They come in different sizes. Thanks for the info, Jescel! hey wow. looks like i found a project to keep kid busy in the holidays. Love to learn about your mother country's recipes. 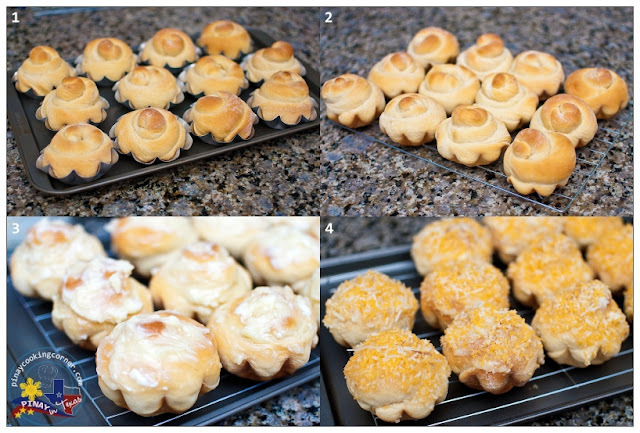 These rolls look absolutely irresistible! ang sarap..... madaling sundin ang instructions. salamat at muling bumalik ang aking pagkabata. how it taste and smells, calls back memories. salamat po ulit. Glad to be of help, Rhobenz! my friend makes her ensaymada with ube. have you tried that? Btw, I am happy to know that I got another reader from UK! Hope you'll share PiTCC with your friends! Thanks! Oooohhh thanks for getting back to me, i have since tried your puto pao and mamon recipe and what can i say they are a real hit here with my family and friends, you lay out things in a way that we can really follow, thank you very much and yes I will share your site to them, again thanks for bringing the panlasang pinoy close to us. thanks for sharing. i'm curious, how many ensaymadas does this recipe yield? Hi! I was able to make 24 ensaymadas from the given amount of ingredients. Hi Tina, I'm Sapphire from Australia. I was just wondering if I could use Plain Flour instead of Bread Flour? Thank you. There will be a slight difference in texture, but yes you may. Hi! Thanks for posting this recipe! Will definitely try making it soon. One question though.. what size brioche molds are you using for the ensaymadas? Thanks a lot! Looking forward to more posts! They are 3.5" in diameter. Hi Tina, I tried this recipe today and found the dough much too wet to handle. I could not even shape the dough, as it was pouring out of my hands. I let it rise for 2 hours, then put it in the refrigerator for 1.5 hours. After that, it was much more manageable, but still very difficult. Your recipe calls for 4 cups bread flour and 3/4 cup evaporated milk, whereas the Goldlilocks recipe book calls for 3 3/4 cups all-purpose flour and 1/4 cup evaporated milk. I think the 1/2 cup difference in the amount of evaporated milk is what makes your recipe too wet. I wonder if you made a typographical error in your post? The 1/4 cup difference in flour probably makes very little difference. Anyway, I thought I'd point it out in case other readers try your recipe and think they've failed. I'll let you know how my ensaymada goes. Thanks for pointing that out...but that was not a typo error. I really adjusted the amount of flour to 4 cups and the amount of milk to 3/4cup because the first time I tried the recipe with the exact same measurement as that in Goldilocks Bakebook, the ensaymadas turned out really hard. I've made ensaymadas with the given measurements above a number of times already and they always turned out good, and the dough isn't wet at all. I'm sorry if it turned out the other way around for you. Hi Tina, Despite my difficulties in handling the dough, the ensaymada turned out really good. They were soft and fluffly. I told my sister-in-law about the original Goldilocks recipe and she said that if I followed that and deviated from yours, then the ensaymada might not turn out so good. I think she's right! So now, what to do? Chiling the dough helped somewhat and I was finally able to roll and twist the ensaymada. Is there anything else I can do to make the dough easier to handle? I tried 3 ensaymada recipes online and yours is the best. Thank you for posting!